With its debut in the spring of 2015, the sophisticated Amadeus Silver II traveled through Holland and Belgium and down the Rhine, Main and Danube rivers. With a name inspired by its award-winning sister ship, The Amadeus Silver, this innovative vessel represents a new standard in design, elegance and engineering. Stay in one of our elegantly appointed Classic Staterooms or Amadeus Suites and enjoy unexpected little luxuries. For us, no detail is too small – especially the sincere smiles of your passionately professional staff and crew. It’s the difference between good service and the kind of service that makes you feel especially good. 7 Night Cruise sailing from Amsterdam to Basel aboard Amadeus Silver II. 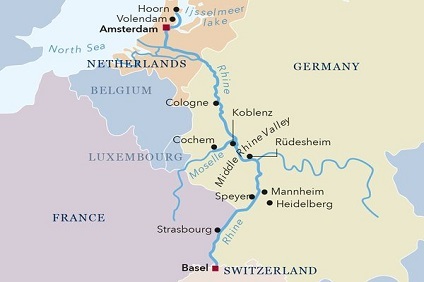 7 Night Cruise sailing from Basel to Amsterdam aboard Amadeus Silver II. 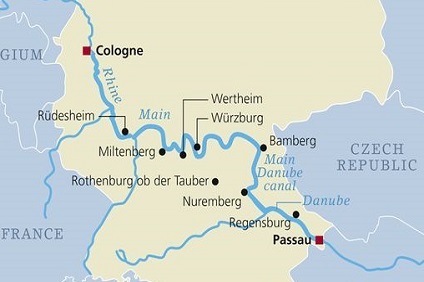 7 Night Cruise sailing from Cologne to Passau aboard Amadeus Silver II. Feel the cool breeze as you sail down the river on your own private walk-out exterior balcony. These 12 deliberately designed suites with a lounge area, offer outdoor seating to sip your morning coffee and 284 sq ft of space to relax. Included are the little luxuries that have earned the Amadeus Silver Series the "2013 River Ship of the Year" award as well as the Amadeus Signature Bed, a luxurious bath and separate shower, WiFi, a flat screen TV, a safe and a minibar. Suites are located on the Mozart Deck. Be transported into a realm of chic comfort in one of the 72 enlarged staterooms. The beautiful 188 sq ft design is loaded with high-tech hospitality and swanky décor. Escape with the view from your state-of-the-art panoramic window on the Strauss and Mozart decks that extends across the entire width of the cabin. Automatically lower the windows to make the stateroom become it’s own balcony. Included are all the necessary details: a flat screen TV, WiFi, cabinet, seating area, a safe, and the Amadeus Signature Bed. Staterooms are located on all Decks. The Mozart and Strauss Decks include the innovative French Balcony. Be transported into a realm of chic comfort in one of the 72 enlarged staterooms. The beautiful 188 sq ft design is loaded with high-tech hospitality and swanky décor. Included are all the necessary details: a flat screen TV, WiFi, cabinet, seating area, a safe, and the Amadeus Signature Bed.